Interactive Fiction (IF) fans will be pleased to hear that Craig Smith has released Frotz [App Store] for the iPhone through the iTunes App Store as a free download. Interactive Fiction, better known as “text adventures" was a popular game genre in the ’70s and ’80s when computers were text-based or offered, at best, very limited graphical capabilities. The first text adventure, Colossal Cave Adventure (also known as ADVENT due to a six-letter filename restriction on the PDP-10 for which it was originally written and available [App Store] as a stand-alone iPhone game) was created by Will Crowther. It was quickly ported to virtually every machine of the day and spawned an IF industry, the most commercially successful games of this sort coming from the now defunct Infocom. The IF titles most gamers may remember is the Zork trilogy, published commercially by Infocom. Infocom published dozens of quality IF titles for most every computer platform available during its heyday. To make the development of such games for multiple platforms as simple as possible, the company created the Z-machine virtual machine interpreter which allowed a common game format, Z-code files, to be used for all versions of its titles, with only the interpreter program being written natively for each platform (not unlike the SCUMM VM, which is available for jailbroken iPhones). The Z-code format became popular among indie IF authors for creation of public domain adventures. Frotz for the iPhone is a port of the popular Frotz Z-machine interpreter that was created in 1995 and is available for a great number of platforms. Frotz is capable of playing most Z-code files out there (version 6 and above, which allow graphics, are not supported at this time). Frotz comes bundled with a number of public domain IF titles, with more accessible through a download repository integrated into the application. Users are able to specify other download repositories if they wish. Frotz presents the player with a menu through which titles can be loaded and, once loaded, renders the adventure in a text window with a pleasant, parchment-colored backdrop. Games can be played in portrait or landscape mode and the standard iPhone text entry keyboard is used for input. For iPhone using IF fans, Frotz is heaven. For those unfamiliar with the genre, this free download is definitely worth a look. IF may have sprung from hardware restrictions, but many gamers feel that the mind, rather than the graphics screen, is the best tool for rendering out an adventure. 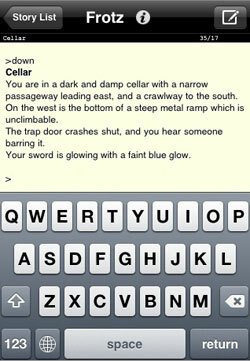 Some of the best games I’ve personally ever played are text adventures. Don’t knock it ’till you try it. In Brief: Frotz is a Z-machine interpreter for the iPhone, plain and simple. It allows the iPhone to play most existing Z-code files, the standard format for interactive fiction created by Infocom.